About Us : Who, we are? Welcome to Cel7 (Cel7.com). We offer custom software development and web application development, including offshore software development model. We create cost-effective custom solutions based on our technical expertise. We fabricate relationship on trust, mututal respect and growth. We have created a methodology which delivers the best. Today every business needs a website to promote their service and product worldwide. 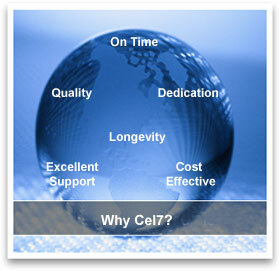 Cel7 (Cel7.com) understands the business needs and give you a complete web solution for your business. We are one of the leading web development company in India offering various web related services for all type of business. Our dedicated web developers implement innovative ideas to your websites for better promotion of your business. Websites designed at Cel7 (Cel7.com) will give a new look to your business and services. Our vision is to bridge the gap between Technology and the end user by providing high quality IT solutions to our clients in selected horizontal and vertical segments, by combining technology skills, domain expertise, process focus and a commitment to long-term client relationships.